See how he does, and, of course, find out how many of these questions you can answer yourself! 50 of the most classic wah riffs in a single take. Learn some of the licks Sister Rosetta used and how to apply them into a traditional gospel chord progression and beyond. Check out video of the never-released guitar in action. The sale, featuring more than 200 pieces of studio and live gear, launches October 30. Items include equipment used onstage with Megadeth in the Nineties. The band has teamed up with Reverb.com to launch the online shop. Three of the Grateful Dead frontman's most lasting contributions to the guitar lexicon. David Gilmour's first guitar solo on Pink Floyd's "Comfortably Numb" is a soaring, melodic masterpiece that uses almost exclusively arpeggios. The gang over atReverb.comrecently posted three handy lesson videos dedicated to Jeff Beck, and you can check them out below. The gang over at Reverb.com loves to test guitarists' knowledge about, well, guitars and other tools of the trade. Is This the Best Classic Electric Guitar Pickup Shootout Video on YouTube? The gang over at Reverb have come up with what might be the best pickup-shootout video on YouTube. Can You Identify These Guitars by Their Headstocks? Can you correctly identify these 12 guitars from just their headstocks? The logos and model names have been removed tomake things a bit trickier. All proceeds will go to Guitars for Vets, MusiCares and Doctors Without Borders. 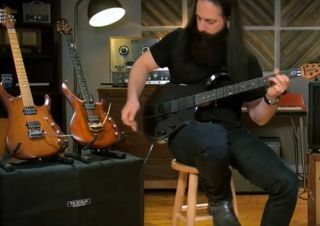 Alex Skolnick and Reverb.com recently got together to create a helpful "Guitar Tricks"video dedicated totriads and sweep picking. You can check it out below. When Zakk Wylde joined Ozzy Osbourne's band in 1987, he was filling the shoes of one of his idols, the late Randy Rhoads. Below, check out a new Reverb.com video featuring Megadeth’s newguitarist, Kiko Loureiro.